I'm a simple lady and sometimes I can't help but try and create some sort of linear equation to understand ideas. I like to try and guess who/what designers were thinking of when they create couture shows - they're a lot of fun relative to ready to wear. 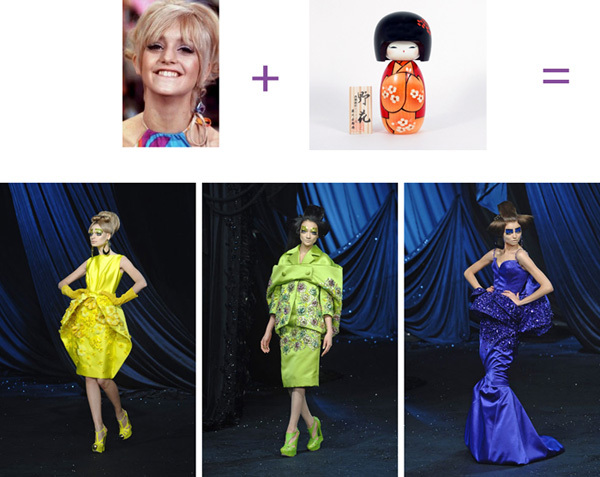 So this equation is what occurred to me when I saw the Dior show the other day. that's great! who is the blonde? this is genius, pure and true. goldie was so cute pre-botox. i can barely look at her now, although she's not so bad as m. griffith. i dont think i need to tell you i have a habit of boiling everything down to its elements, myself. there's a great scene in 'the player,' where two writers are pitching a movie to a producer. they say it's about a tv star who goes to a small village in africa to feed children, and they want julia roberts for the role. so they tell the producer, 'it's like pretty woman meets out of africa, but with a heart - in the right place.' always loved that.